A Classic Fire Lookout, one of the best remaining in Oregon. The Mt. Pisgah site began to be used in 1918, and has had several incarnations of various types and sizes of lookouts......Lookout history: After a high point in the 1950s, the number of manned lookouts in the Northwest declined steadily, and many were torn down and burned by the Forest Service in the 70's and 80's, and others were simply abandoned to the harsh mountain weather and have been lost through decay and neglect. An example was the lookout station on top of 9,038 ft. Strawberry Mountain. Mt. Pisgah, however, is in great shape. This beauty is found about 40 miles east of Prineville on the Ochoco National Forest, on the north side of Big Summit Prarie. Its Bibical name is probably in reference to a great view of the Promised Land attained from the Biblical Mt. Pisgah by Moses. Although the Lookout tower can be driven to with a passenger car with good clearance, a pickup or SUV will be much better as the road is narrow, dusty, and occastionally quite rocky/bumpy. We found the long-time lookout keeper Mike and his son to be very hospitable. The road usually clears of snow in mid to late June. See if you can spot the groves of Mountain Mahogany trees near the summit--- these are fugitives from the desert mountain ranges of Nevada! The ancient wooden garage on the summit is on a National Historic register and is inhabited by pack rats. Despite this lookout tower's seeming remoteness, on a very clear day, about one dozen manned lookouts are visible (eg. through a good spotting scope), along with about six more that are currently unmanned or abandoned. Click here for Lookout Towers in Ochoco Mtns such as Lookout Mtn. Click for link to the Sand Mountain Lookout Society, which is based in Portland, Oregon and dedicated to the restoration and ongoing maintainance of several classic Oregon lookouts. 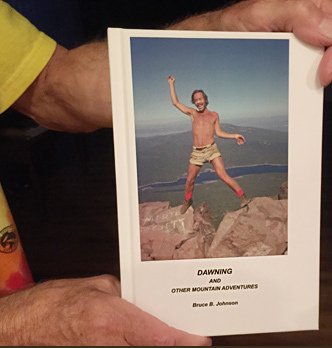 A founding member was my old friend Doug Newman from my days at the University of Oregon Outdoor Program in the late 1960s. It was created in 1920.......Who remembers the old Skyline Trail nowadays? It was the little path through the woods, the one which used to wander right on the edges of the beautiful mountain lakes, right through the centers of luscious, flowery meadows, right along the banks of rushing streams and rivers? The one that busted your gut going straight up the mountainsides, and hurt your knees going straight down? The one that was so intimate with the wilderness....... long since replaced by the Pacific Crest National Trail System, which is so much more proper and politically correct, but in some ways so much less intimate with the very Wilderness it seeks to protect. And don't forget the rustic, cozy shelters that we used to enjoy. Pictured above, Jack Shelter, which was located about 2 miles north of the present-day Santiam Pass summit (R.I.P. in 1972, see section of 1964 map on the left). The Pacific Crest Trail in history: The bigger, longer cousin to the Oregon Skyline Trail runs from the Washington/Canada border all the way south to the Mexican border-- a whopping 2,650 miles worth of footsteps! The Oregon Skyline Trail had been brought in with much publicity hoopla by Oregon tourism officials in 1920.... Six years later, in 1926, a person named Catherine Montgomery advanced the concept of a Canada to Mexico trail to a Joseph Hazard, who took the idea straight to the Mt. Baker Club in Bellingham, WA. This set in motion a large number of mountain clubs and outdoor organizations. By 1928, Fred Cleator with the U.S. Forest Service developed the Cascade Crest Trail in Washington.... California was very late in following suit, and it wasn't until the 1960s that a formal, designated trail was tacked down in that State, thus completing the dream of 1926. By the 1960s, the official Oregon Skyline Trail had had the number 2000 tacked onto it, just as seen in this picture taken just north of Mt. 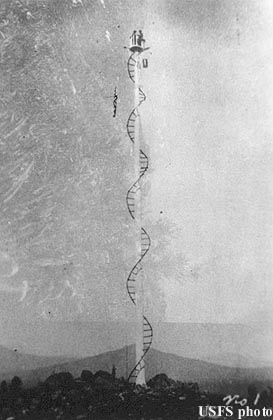 Jefferson in the early 1970s. Famous Oregon Mountain guide Dee Wright scouted a northern section of the Skyline Trail in 1896. Premier northwest photographer Fred H. Kiser blazed the Skyline Trail from Mt. 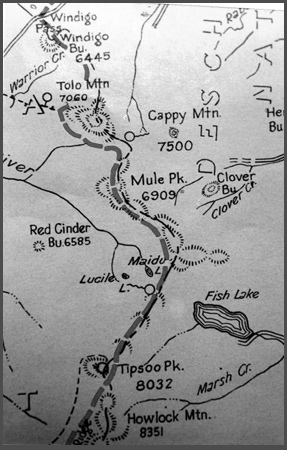 Hood to Crater Lake in 1919. Mr. Eaton wrote a book about a trip down the old Trail that old Skyline Trail lovers should find and read: "Skyline Camps", c1922.... Also to be noted: The high Cascades harbored a rich treasure of fur-bearing animals and by the year 1900, a fur trapper named Adrian Rajoul had laid a claim to a trapping territory extending from the south slopes of Mt. Hood into Jefferson Park on the north side of Mt. Jefferson. To mark his claim, he was required to build "cabins" along the route, which were really more like shanties or lean-tos for sheltering in while working the trap lines. Rajoul's route pretty much was the Skyline Trail outlined on the official 1921-1931 maps that I refer to elsewhere on these pages. Neil Z., Southern Cascade old trails enthusiast welcomes your emails. He's hiked the entire abandoned Skyline Trail from Lake of the Woods to Crater Lake, and reports that it is difficult but highly rewarding. Are there any of you readers out there who love finding and hiking the remaining bits and pieces of the now-abandoned Skyline Trail? I'd be interested in hearing from you, and especially would like to add an image of one of the classic original enamel trail markers, in place in some scenic place. Visit the website of the Pacific Crest National Scenic Trail Association, covering all of the Oregon, Washington, and California segments of the Trail, and alerting you to political developments affecting the Trail. This is "THE" group to join for any PCT lover! They are based in Sacramento. Take Political Action! Call or write the Oregon State Government about your love for the historic Skyline Trail: write or call the "Oregon Historic Trails Advisory Council," 1115 Commercial St. NE, Suite 2, Salem, OR 97301-1012. Phone number 503-378-4168 ext. 231. Fax 503-378-6447. Contact person: "the Deputy State Historic Preservation Officer." The high-altitude hemlock forest at Mule Peak* was dark and cool and very, very quiet. I had hiked all day alone, never seeing anyone, the only wildlife signs were small invisible bird chirps, and once the flick of a squirrel's tail as it ran for cover. Something in me began to long for a distant view and open sky above; I was between jagged Mt. Thielson to the south and glaciated Diamond Peak to the north, their peaks were like friends whose familiar faces I longed to see. When my altimeter was to 6,600 ft. I knew I was close to the summit, so I left the PCT. My route went east toward what my topo map hinted might be a steep area that might be rocky, and hence open, and I could hope for a viewpoint. After a few hundred yards of walking through the open but dark old-growth hemlock woods, I came upon a faint track, and it seemed to be heading generally where I wanted to go, so I followed it. Soon I began to note the tell-tale signs that this was no mere game trail; there were very old blazes, dim and mostly absorbed back into the tree bark; also, here and there were a few geometrically sawed-off tree trunks, nothing recent, all old and mouldy. I began to see brighter light ahead, and soon rocky areas appeared. Far beyond the Cascade Range, bright swatches of sunny Eastern Oregon pine forests shone through gaps in the trees. .the 1930's, so long gone, the trail builders rerouting the original Skyline Trail from the lowlands route of the early 20's, high up to the spine of the Cascade Crest. It was probably the CCC men, grubbing and marking this trail lovingly. How many years had gone by since their work was bypassed by the modern PCT? And how many quiet years had it been since human footsteps had trod this trail? And how many more years would this unmaintained and forgotten gem exist before Time took it back, and it became so dim that it would be lost to history, forever? Go to page bottom for notes about the trail sign image to the left. Still deep in thought, I pushed through some dense, young saplings and suddenly stepped out onto the broad and somewhat dusty expanse of the PCT. * and Mule Peak is part of my continuing secret, because I have chosen to call the location Mule Peak for purposes of the story above (the real Mule Peak is elev. 6,860'). The true location is somewhere along a 3 mile stretch of the PCT near/around Mule Peak! Go exploring for yourself. That will be the real Fun! 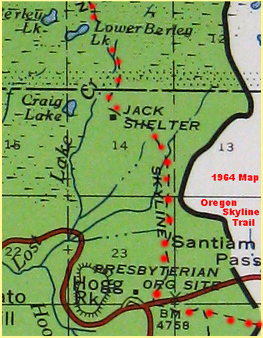 Below is a scanned image of the 1931 version of the 1921 "The Oregon Skyline Trail" map. It will show you the area including Mule Peak. An interesting feature is the big lake shown as "Fish Lake," which in modern times has been "Miller Lake" for many decades! This scan shows little-travelled Windigo Pass in the north, probably Oregon's least-travelled passenger-car route across the Cascade Crest. The south edge extends to lofty Howlock Mountain in the south. Click here for more on Howlock Mtn. The trail sign being "eaten" by the tree was contributed by reader and PCT lover Monte Dodge. Readers will note that the sign being eaten is a "Pacific Crest Trail" sign, rather than one of the earlier "Oregon Skyline Trail" signs I witnessed that day on Mule Peak. To me this image helps explain one reason why original Skyline Trail signs are so rare-- my theory is that many of the remaining "Oregon Skyline Trail" signs are now invisible, totally absorbed back into the bodies of the trees upon which they were tacked. I've waited long and lonely to serve my purpose. People used to visit and tend to me on a regular basis. Then they stopped. Seduced by younger trails with nicer grades. I feared I should perish and be taken back by the wild before ever again feeling the sweet, weight of hiker's boots upon my spine as I guide them safely through the woods. But I'm still here. Waiting to show a new generation of hikers a new adventure and a piece of trail history almost, but not quite, lost. Link to my story about a mountaintop spiritual awakening experience: "Dawning"
Link to my story "Dark Lake of My Dreams"
Link to my story "Mountain Night on the Skyline Trail"
Link to my story "Young and Dumb at Crater Lake"
Link to my story "Windstorm on Mt. Shasta"
Link to my story "Death by Stereotype"